Entomolgists with University of Wisconsin-Madison and USDA APHIS have initiated a biological control program for Emerald Ash Borer. Like other classical biological control programs (e.g. parasitod wasps for biological control of alfalfa weevil and soybean aphid), the wasps are very tiny, stingless insects that are host specific to Emerald Ash Borer. Parasitoids are identified from the pest insect’s native geographical range, in this case East Asia, where the pest and natural enemy developed in association with one another. Their stinger has been modified to an ovipositor that enables them to lay an egg in the Emerald Ash Borer. The egg hatches into a larva that used the Emerald Ash Borer as a food source, killing it in the process. Although Emerald Ash Borer is not a field and forage crop insect pest, UW Extension has received inquiries from concerned honey bee keepers under the impression that the parasitoid wasps released for Emerald Ash Borer can harm honey bees. It’s not clear how or where this impression originated. Likely, someone interested in the 0.04 to 0.2 inch parasitic wasps that specialize on Emerald Ash Borer, googled “Asian wasp” “Japanese wasp” or “Asian giant hornet”. Such searches will bring up a large (2 inch) vespid wasp native to temperate and Eastern Asia. This insect has no association with Emerald Ash Borer and has not been released for any biological control program in Wisconsin or the U.S., but it can attack honey bees. 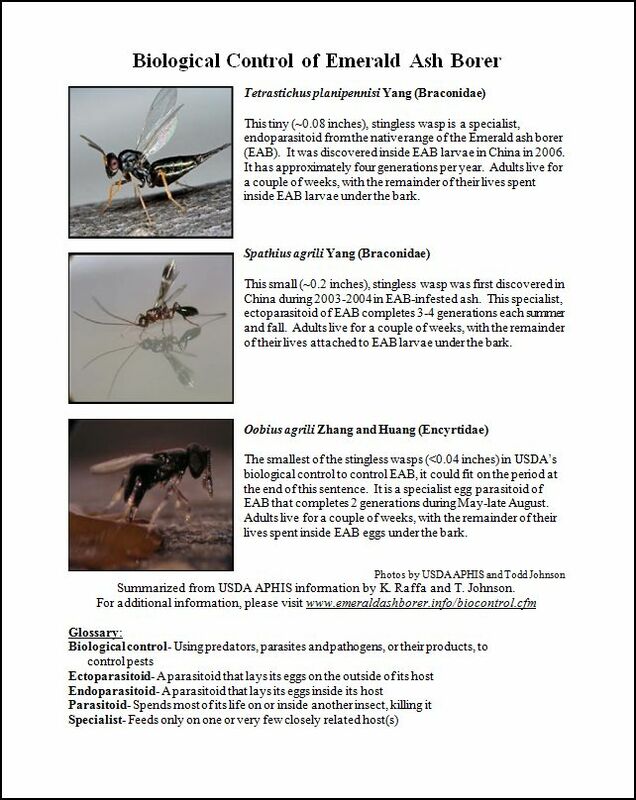 Dr. Ken Raffa, Professor of Entomology (forest entomology and insect ecologist) and his research assistant Todd Johnson developed the following fact sheet to clarify the situation for Wisonsin bee keepers and other interested agriculture professionals. Please click here for the one page fact sheet titled Biological Control of Emerald Ash Borer.